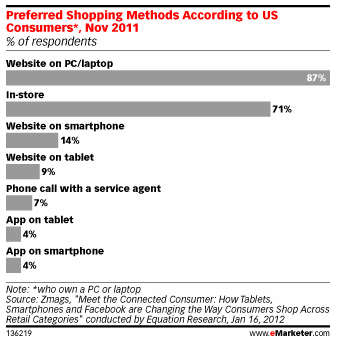 Is Your Mobile Marketing Keeping Pace with Your Users? There is no question that the current hot marketing topic is mobility – be it Web, application, SMS, or eCommerce. What’s odd is that so many companies are just now considering it a medium worth its own strategy. It’s odd because of users’ broad adoption of mobility – for consumption, business, and interaction. It’s odd because users expect brands to keep pace with them. A recent eMarketer article about brand mobile site offerings brought some disappointing trends about this to the surface. Despite the widespread adoption of mobile devices by consumers, it’s clear that brands remain behind – and the longer you wait, the more likely you are to rush, and the more disappointed your users can become. Simply-put, Web sites have a tendency to become confusing. Between departments battling over prime real estate on the desktop site and the general content atrophy that naturally occurs over time, Web sites often become bloated with out-dated content. We observe frantic clients trying to shoe-horn in mobile development without much thought about the overall strategy. Of course, that’s where we come in – but when this happens without our guidance, it often results in the development of a limited-scope mobile experience. What that means is that the marketing leadership will plan a mobile project that only includes what they think is important. The problem: staff can suffer from a familiarity syndrome that customers don’t. In other words, they’re marketing to themselves, not the user. So, how do you avoid making this mistake without creating a monster mobility project that will never end? The short answer is: engage in a User Experience Design project. What does that mean? It means that you identify your target users, observe them, and ask them for feedback. It means that you actually interact with your customers and users in a way that allows you to understand your brand from their perspective – and it’s a process that we go through with our clients in both mobile design and marketing experience creation, so we know that it results in success. The end result is an informed plan for approaching and enabling your users on their mobile devices with the features that they expect and require (rather than simply the ones you think they need). You should be aware, from our previous posts about mobile web and native application development, that mobile applications are not right for every brand, and may not be right for yours. It’s important to understand that, especially in light of recent research that shows us that mobile apps – at least for commerce – don’t always gain the adoption that a mobile Web site can. Only understanding how your customers and users consume your marketing (mobile or not, time of day, during what other activities) will give you the confidence that your messaging is getting through [See Get Your Customer Experience Right for the Medium]. What is bound to confound (see what I did there? Ha), however, is the rapid spread of tablet devices. What you can see from the eMarketer research is that tablet consumption is far below desktop consumption, but not that far behind mobile phones (considering their time in market, it’s pretty impressive). However, most mobile sites are designed for a mobile-viewing or desktop-viewing experience – which can frustrate your users. With the larger form factor, users expect the same breadth of information and complete navigation and access. However, with most users utilizing the standard gestures support for navigating a site, a traditional desktop experience provides less-than-satisfactory browsing (consider link size, Flash-support or lack thereof as examples). Without considering the amount of mobile tablet traffic you receive, however, it may not be worth designing experiences for the audience. But how will you know without understanding your customers? (Notice a theme here?) Only through knowing their mobile device behavior, can you make an educated decision on how specifically you should design experiences for tablets. 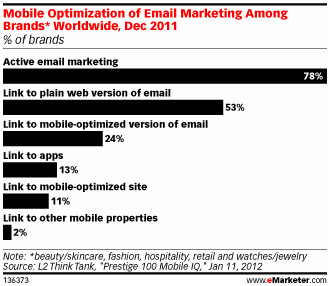 Possibly the most concerning piece of information to come out of these findings is the lack of attention to optimizing E-mail for mobile consumption. Certainly, these findings are isolated to specific industries, but if your industry falls outside of the highly transactional B2C ones quoted in the study, the numbers may be even lower. Your users expect a mobile experience by now, and this year will reveal even more valuable behaviors than ever before as more and more brands mix mobile strategies with their other channels. However, if you don’t get the user experience right, you could easily end up spending time developing an application that doesn’t get used or a mobile site that disappoints. We can help you get the user experience right the first time – for mobile development or other engaging experiences. Let’s work together.